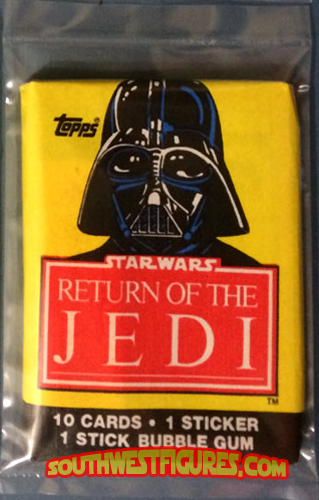 Trading cards are one of the oldest but still a very popular way of building collectibles. The oldest trading cards are said to be sports (baseball cards) from the late 1800's. TV and Movie cards capture fond memories of Hollywood history. Trading cards are limited in production to the year that is shown by the particular item. 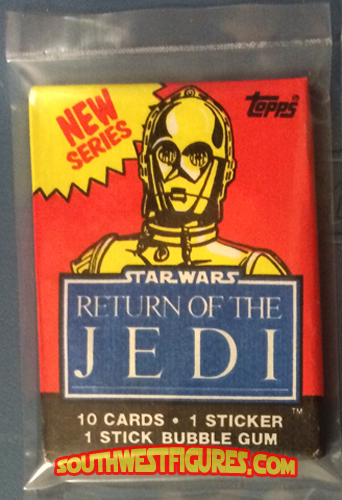 The oldest trading card company who is still in business today, Topps®, was founded in Brooklyn, New York in 1938. 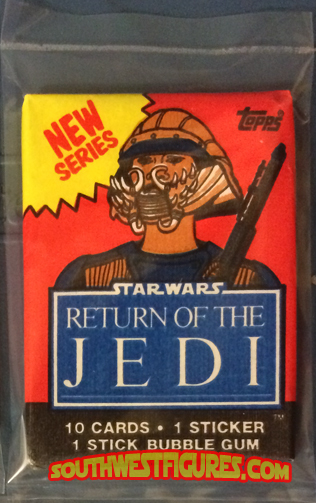 Sealed wax pack Series 2 (SR2) Return of the Jedi (1983) trading cards. Each pack contains 10x movie cards, 1x sticker, and 1x piece of gum. We found that the gum is in the same rock hard condition as it was in 1983 but please do not eat the gum. Special Offer Get this item in our thick sealed baggie, FREE! 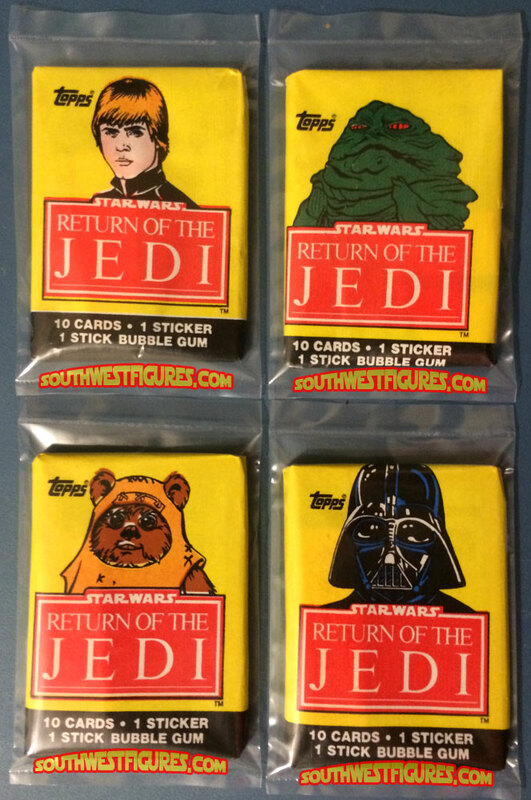 Get all FOUR (4x) Sealed wax packs Series 2 (SR2) Return of the Jedi (1983) trading cards. 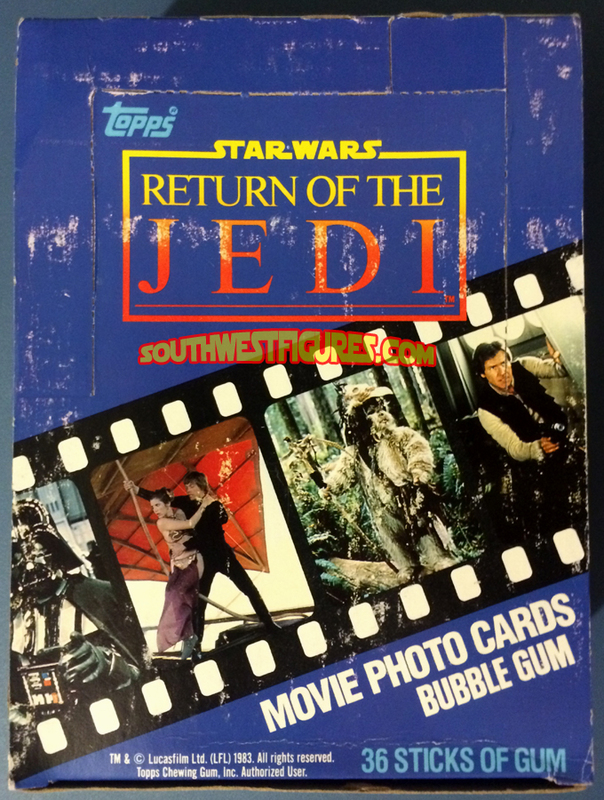 Each pack contains 10x movie cards, 1x sticker, and 1x piece of gum. We found that the gum is in the same rock hard condition as it was in 1983 but please do not eat the gum. Special Offer Each pack comes in our thick sealed baggies, FREE! In SR2, Leia was printed with a red tint to her face (above left photo). 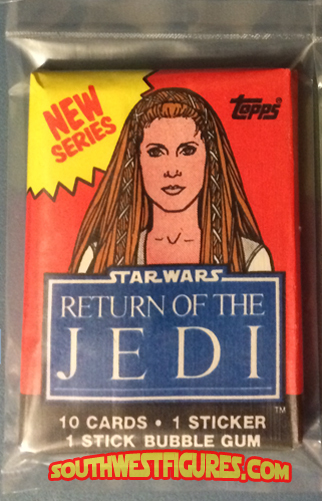 We found one where Leia has a more cream face (above right photo), and did not find this in any of our many boxes. Offering our only variant and traditional pack here in this set. 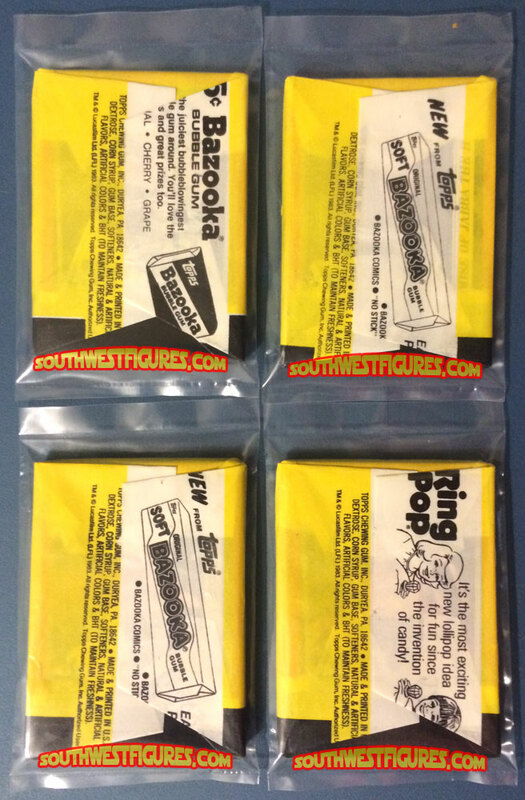 Sealed wax packs. 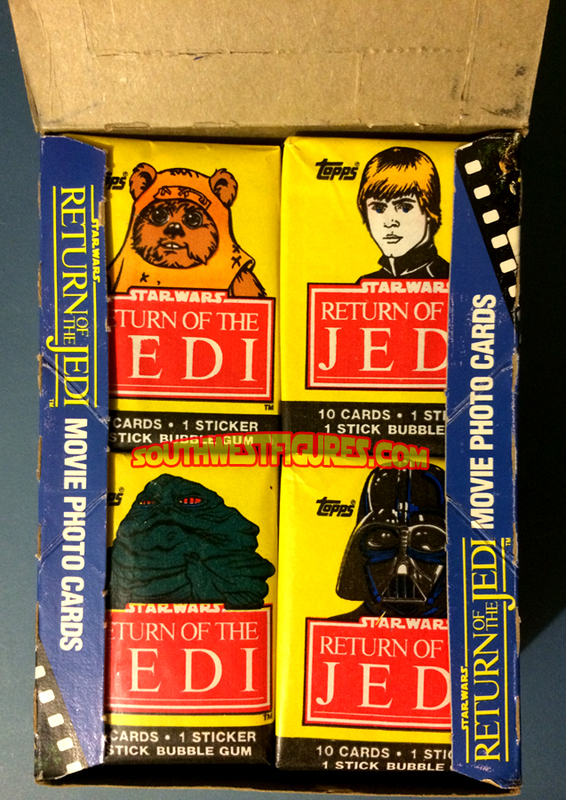 Each Series 2 (SR2) Return of the Jedi (1983) trading cards contains 10x movie cards, 1x sticker, and 1x piece of gum. We found that the gum is in the same rock hard condition as it was in 1983 but please do not eat the gum. Special Offer Get these items in our thick sealed baggie, FREE! 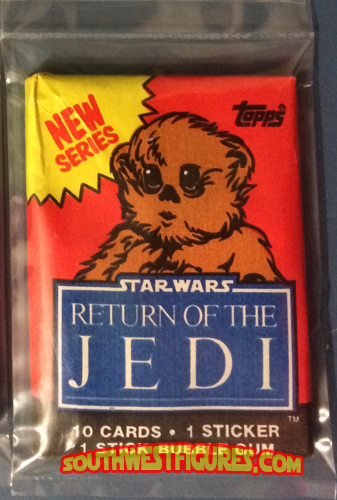 Variant pack comes with unique serial-numbered, tamper-evident hologram seals to help maintain authenticity. Stock photo (box shown wrapped in our big baggie). Details below. 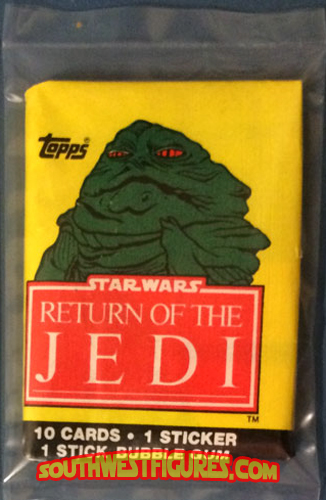 Complete Topps factory wax box with 36x individually sealed wax packs. Each pack contains 10x movie cards, 1x sticker and 1x piece of hard gum. Per box that's 360x Star Wars trading cards, 36x stickers (396 items total), and 36 pieces of hard gum. 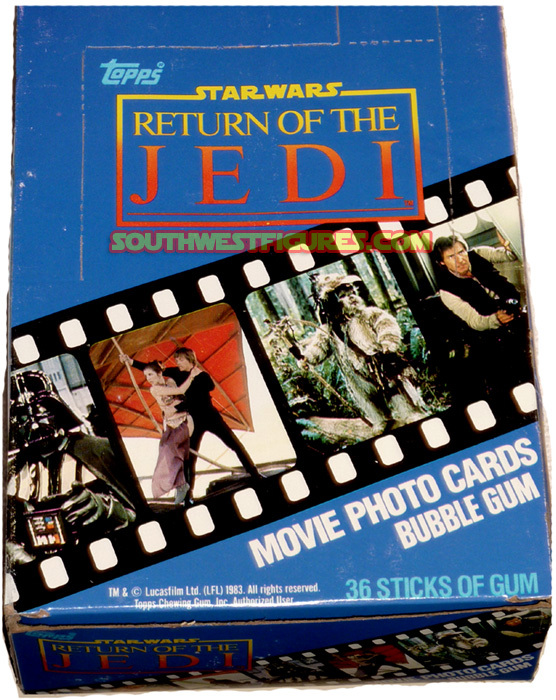 We found that the gum appears to be in the same condition as it was in 1983 (preserved with BHT), but please do not eat the gum. Box Condition: C7. Will have factory black "X" in some similar variation from corner-to-corner on box face. 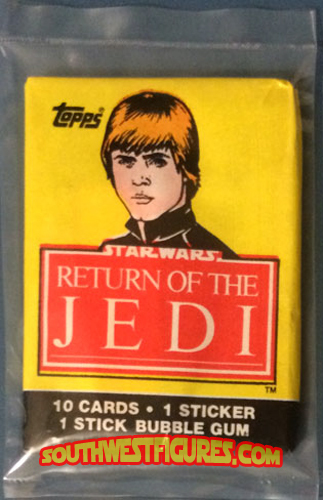 Individual packs have NO marks. These "X-Boxes" were discontinued and re-sold to dealers at the end of the series run. Packs are counted 3-4x then the box is wrapped in our big baggies to help long-term preservation. Box Condition: C75. NO factory black "X" on box face ("Clean face box"). Back of box has no factory black markings either. 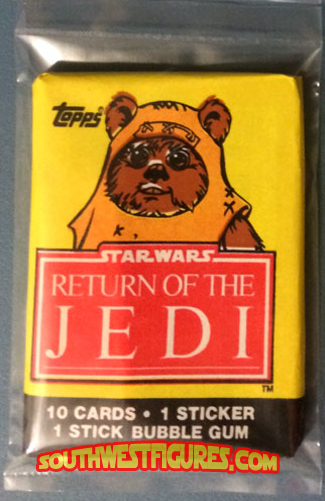 Individual packs have NO marks. Packs are counted 3-4x then the box is wrapped in our big baggies to help long-term preservation. Box Condition: C8+. NO factory black "X" on box face ("Clean face box"). Back of box has no factory black markings either. 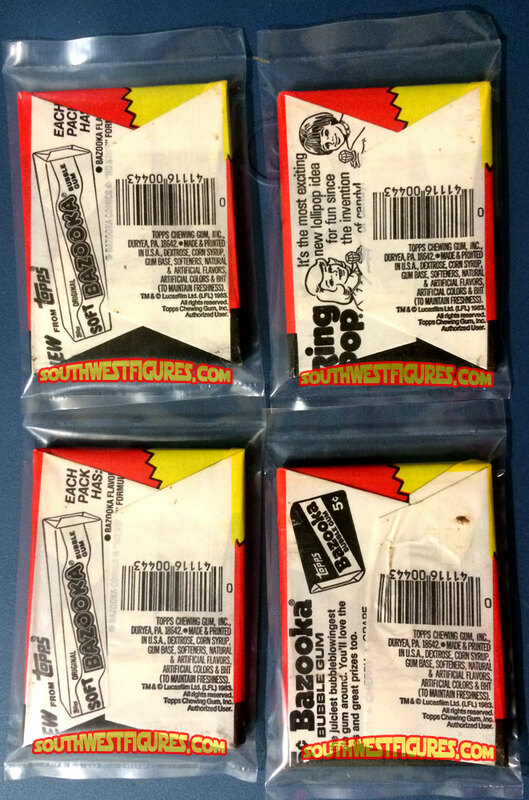 Individual packs have NO marks. Packs are counted 3-4x then the box is wrapped in our big baggies to help long-term preservation. 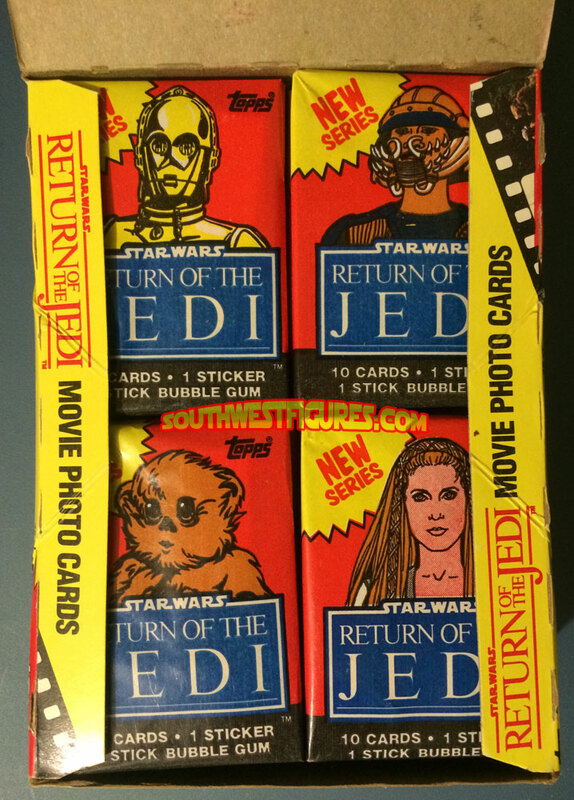 Sealed wax pack Series 1 (SR1) Return of the Jedi (1983) trading cards. 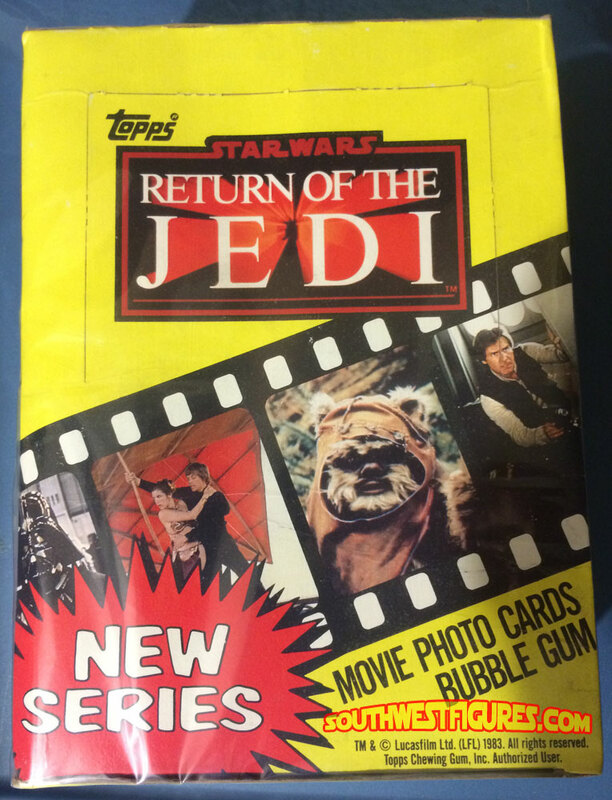 Each pack contains 10x movie cards, 1x sticker, and 1x piece of gum. We found that the gum is in the same rock hard condition as it was in 1983 but please do not eat the gum. 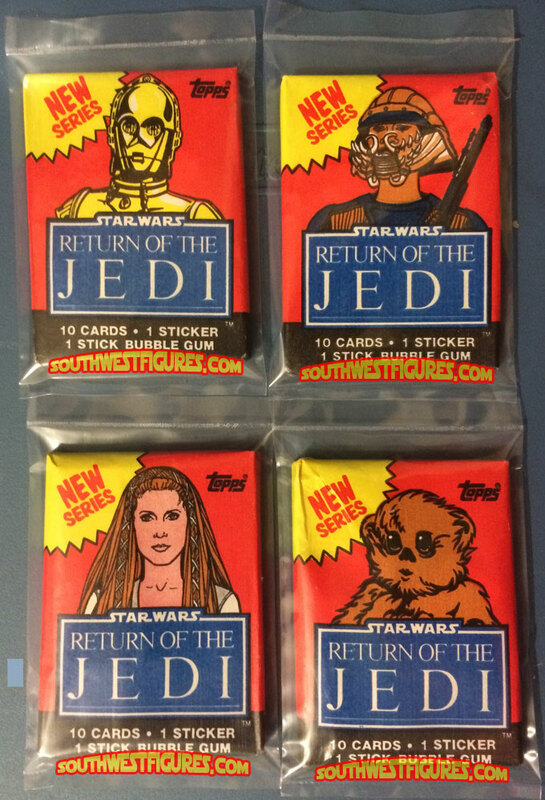 Get all FOUR (4x) Sealed wax packs Series 1 (SR2) Return of the Jedi (1983) trading cards. 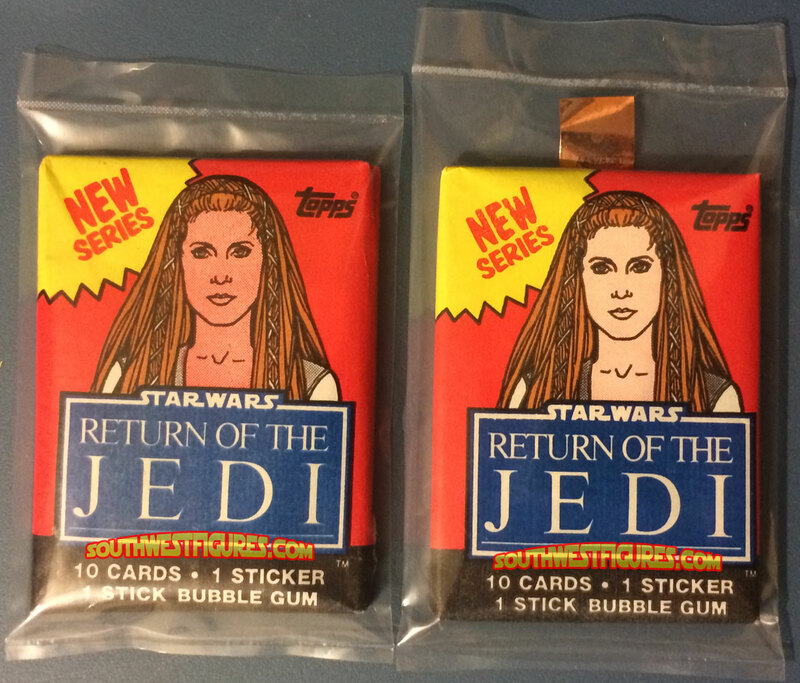 Each pack contains 10x movie cards, 1x sticker, and 1x piece of gum. We found that the gum is in the same rock hard condition as it was in 1983 but please do not eat the gum. 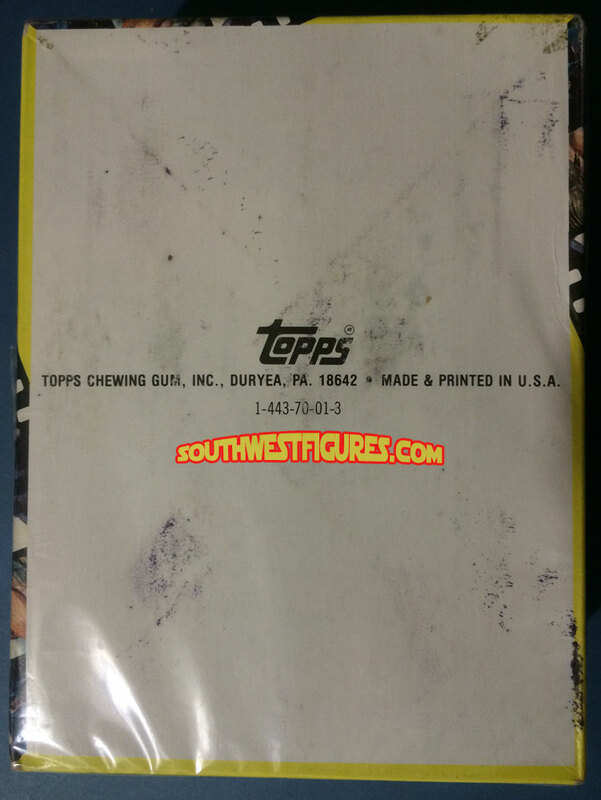 (1) Complete Topps original factory box containing 36 packs with 10 cards per pack, 360 Star Wars trading cards, plus 36 stickers (396 items total), and 1 piece of gum per pack. We found that the gum is in the same hard condition as it was in 1983, but please do not eat the gum. 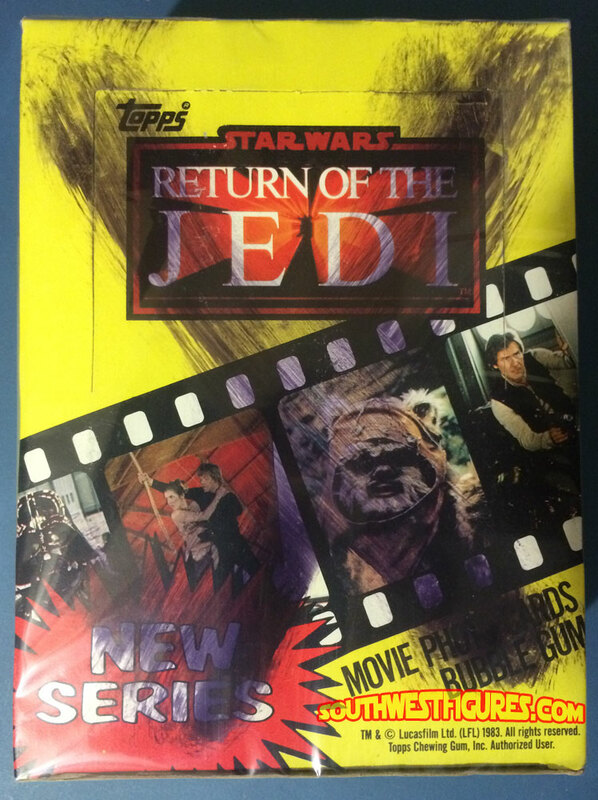 Includes multiple copies of all covers - Darth Vader, Ewok, Luke Skywalker, and Jabba the Hutt. (C7 Box) - Will have factory black stripe OR "X" on box face. Packs are untouched. These were discontinued and sold to dealers at the end of the series run. Very common. e-mail any questions. (C75 Box) No Black Stripe or "X" on box face. (C8 Box) No Black Stripe or "X" on box face. Highest quality we have available.